In 1968, at the height of the Cultural Revolution, the Chinese Communist Party endorsed a radical new system of health-care delivery for the rural masses. Soon every village had at least one barefoot doctor to provide basic medical care, creating a national network of health-care services for the very first time. The barefoot doctors were portrayed nationally and internationally as revolutionary heroes, wading undaunted through rice paddies to bring effective, low-cost care to poor peasants. 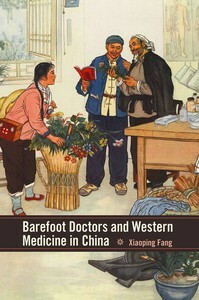 This book is the first comprehensive study to look beyond the nostalgia dominating present scholarship on public health in China and offer a powerful and carefully contextualized critique of the prevailing views on the role of barefoot doctors, their legacy, and their impact. Drawing on primary documents from the Cultural Revolution and personal interviews with patients and doctors, Xiaoping Fang examines the evidence within the broader history of medicine in revolutionary and post-reform China. He finds that rather than consolidating traditional Chinese medicine, as purported by government propaganda, the barefoot doctor program introduced modern Western medicine to rural China, effectively modernizing established methods and forms of care. As a result, this volume retrieves from potential oblivion a critical part of the history of Western medicine in China. Xiaoping Fang is research fellow at the China Research Centre of the University of Technology, Sydney, Australia. Review: "Xiaoping Fang gives the English-reading world a reliable account of the barefoot doctor movement and its tremendous importance in the creation of the Chinese health-care system. Contrary to received opinion, Fang shows how the movement prompted a decline in the popularity of traditional healing methods while promoting biomedicine in the countryside. This study greatly advances our understanding of the history of medicine in modern China." --Bridie Andrews, associate professor of history, Bentley University.